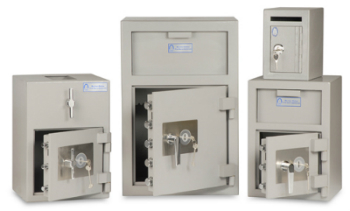 A range of Teller deposit safes from Burton. These safes are ideal for use in retail shops, pubs, clubs, restaurants and other environments where cash is handled. Cash Ratings between £1,000 and £3,000 available. Large amounts of cash can be safely deposited quickly and easily to prevent surplus money being left vulnerable to thieves or smash and grab raids. Call us today on 0117 9674994 to ask any questions you may have about Burton Teller Deposit Safes.